Alright, I'm sorry. You can blame me if you look out your window one night and see chunks of the planet Novenia whirling around in the inky sky. It's my fault. I could have stopped the destruction before it started. But I blew it. I allowed the evil Egron empire to build that star-powered plasma projector that blasted Novenia into more pieces than a porcelain doll in a blender. Don't ask me how it happened. One minute I was sitting there in front of my ST booting up a copy of Rainbird's Starglider II. The next thing I know, it's up to me to save the universe. Or at least the part of it known as the Solice and Novenian star systems. Save a couple of solar systems? Me? Come on! Who do I look like, John Wayne? Johnny Carson would be more like it. What do I know about flying a police patrol craft called the Interplanetary Combat and Reconnaissance Universal Scout (ICARUS)? To make matters worse, Rainbird really never told me exactly what I was supposed to do. Oh, the company definitely provided me with plenty of documents to look at. There was a nifty little novella by James Follett that brought me up to date on the original Starglider saga and explained the new nastiness that the Egron empire was up to. There also was a Mission Briefing Dossier that provided me with detailed information about the planets and moons comprising the Solice system and told me all about the ICARUS' creation, explained its features and described its control panel. Finally, there was a key guide that showed me how I could control the ICARUS by using my ST's keyboard and a mouse or joystick. But being the dimwit that I am, I would have liked a little more than that. I craved something that would spell out for me in no uncertain terms what my mission objective was and exactly what I needed to do to carry it out. Certainly some people would consider such instructions a case of stating the obvious. But I prefer to have the obvious pointed out to me when the fate of the universe is resting on my shoulders. As it turns out, my shoulders weren't up to the task. I struggled to keep the ICARUS flying and save Novenia and the Solice system from Egron evil. Judging by the message screen that popped up every time the ICARUS was blown out of the Apogean sky, I failed miserably. I lost count of how many missions ended with the computer mocking me. My repeated failures to save the universe were often greeted with the message: "Try shooting Egrons next time." Hey, I did try! But most of the time it felt like I was at the wrong end of a shooting gallery. 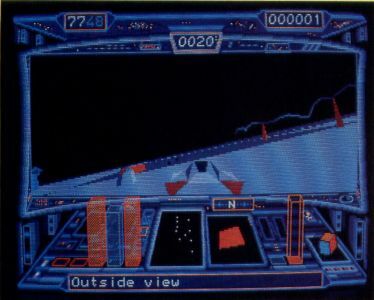 Starglider II's superb graphics, animation and responsiveness told me in no uncertain terms that I was definitely piloting this fast, maneuverable and heavily armed vehicle called ICARUS. But the constant pounding I took from Egron patrol craft, stompers and even space pirates made me feel as though someone was trying to win a teddy bear by hitting my bull's-eye. You know, the old ten-shots-for-a-dollar syndrome. Admittedly, I was a pretty wretched spacecraft jockey even during those rare moments when nobody was trying to blast me from the sky. I managed to destroy my spacecraft a few times by simply running it into the ground or other inanimate objects. I never quite got the hang of using the ICARUS' grid-coordinates instrument to figure out where I was or how to get where I wanted to go. X and Y axes? Huh? Compounding my problem was the mind-boggling array of instruments and controls at my disposal. Speed, compass heading and digital clock I could handle. Tri-axial artificial horizons, energy shield status readouts and inductive refuelling were a little out of my realm. Starglider II has all the tools required for some slick flying. Unfortunately for Novenia, I find self-service gasoline pumps a technological challenge. On the other hand, if you've got at least a normal amount of coordination and a little patience, you can probably master Starglider II without too much trouble. And you'll have a blast doing it. The graphics are outstanding: bright, colorful and solid. Personally, I found them to be a little surreal for my taste, which runs more to flesh-and-blood or at least sheet metal and steel objects. But if you fancy yourself a Luke Skywalker-type, you'll get a blast out of the strange creatures and dazzling effects that will cross your path when you're in the ICARUS. What really impressed me, though, was the sensation of flight conveyed by Starglider II. Despite its out-of-this-world premise, the program may be the most realistic flight simulation ever created for the ST. 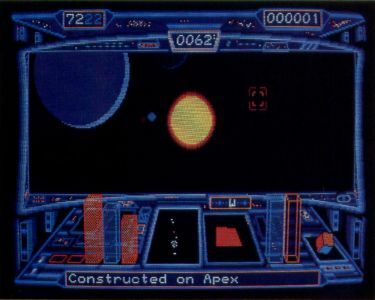 The good graphics—particularly those of the cockpit control panel and the 3-D-like imagery of the planet and objects below—contribute a great deal to that realism. But the greatest contributor to Starglider II's realism is its animation. Scrolling is so quick and smooth that it's quite easy to forget that the action is taking place on a computer monitor and not in real life. Point the ICARUS' nose down, and you'll swear you're descending in a real aircraft. Increase velocity and climb into the upper atmosphere, and you can almost feel the G-forces tugging at your back. Response to mouse and keyboard input is no less realistic. All controls work exactly the way they're supposed to. The onscreen images react so quickly and precisely to inputs that it's easy to forget you're operating a computer and not a real spacecraft. The significance of that cannot be overemphasized because Starglider II is in essence an arcade shoot 'em up that demands good eye/hand coordination and quick reflexes. It's sophisticated enough, however, to also require a healthy dose of puzzle-solving, strategic planning and mastery of flight simulation controls. Apparently, my prowess in those areas left something to be desired. I was putty in the Egrons' hands. Starglider II gave me a chance to save part of the universe, but I let the Novenians down.